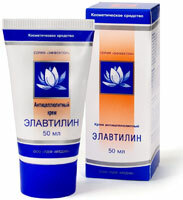 Home » ELAVTILIN Cream for reducing cellulite for Denas. .
- Malavit – possesses anti-inflammatory, antiseptic and anesthetizing action. - The Extract of Siberian ginseng – аdaptogen,possesses antioxidant properties, normalizes work of cellularstructures and blood supply of a skin, possesses toning up action andimproves metabolic processes. - Juniper oil – аdaptogen, aromatizes, possesses antioxidant action. - Oil of jojoba – аdaptogen, possesses anti-inflammatory, softening and nutritious qualities, reduces formation of wrinkles. - The ascorbic acid /Vitamin C/ – stabilizer of cellular membranes, reduces damaging action of hypoxia (lack of oxygen in tissue),improves power maintenance of cells. - Amber acid – increases speed of respiratory processes in tissues and improves energy supply of cells, improves the tone of tissue. - Riboflavin (Vitamin В2) – participates in tissue metabolic exchange, normalizes the exchange of fats, carbohydrates,amino acids, strengthens regenerative processes in the skin. - Retinol acetate (Vitamin A) – adaptogen, stimulates skin formation and prevents superfluous horning of skin, prevents dryness of skin. - Lipoic acid – normalizes functions of cells of the liver, interferes with formation of an excessive fatty tissue. - Lidaza – contains proteolytic enzyme hyaluronidase, possesses absorbing action, increases permeability of tissuesfor biologically active substances, normalizes movement of an intercellular liquid. Owing to unique structure active components of this cream quickly get into deeplayers of the skin and blood that allows to increase considerably efficiency and duration of their action. ©2013 Kalinka-Store.COM. All Rights Reserved.